This is one that I am sure to make again...over and over again! 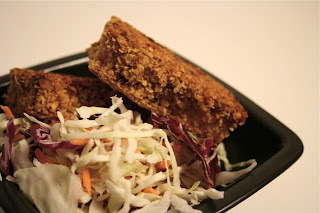 I use this technique often when I make cornflake chicken for my family, but I normally just quickly cook some tofu for myself when I do that for them. Well, I had a different plan this time. I decided to try some cornflake tofu for myself! I have to say that I was extremely impressed with how this one turned out! Not only that, it is extremely versatile. Those are my favorite recipes...the ones you can use the same technique, but change the flavors! So, this one was a learning process and I learned from my mistakes, but it was still good and I was completely shocked! First off, I did not drain the tofu well enough. From my experience, which is extremely limited, you have to drain and press tofu really well if you want a meatier texture. So, I ended up baking this for about an hour (I think due to too much moisture) trying to get it to firm up some. I was wondering when the cornflakes were going to burn. They never did! I loved the texture of the final product and I am ready to make it again! ***By the way, reheat it in the oven or toaster oven. It crisps up the coating again! Slice, press, salt and pepper tofu. Grind cornflakes. Dip tofu in mustard mixture and then dip it in the ground cornflakes. 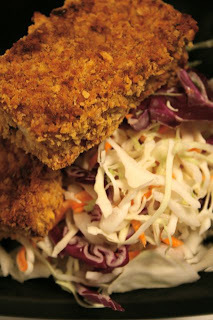 Place the coated tofu on prepared baking sheet and bake 15 to 20 minutes on each side. yum, that looks so good! i never have cornflakes tho, so i might just have to buy a small box! I'm struggling to find tofu recipes that Chris will enjoy. We'll definitely give this one a try!